Hampshire became the first Division One side this season to win three County Championship games as they wrapped up an innings victory over Warwickshire. Only the risk of bad weather threatened to deny the hosts going top, but Warwickshire's third innings defeat of the season was completed after lunch. Resuming on 75-2, Bears hopes rested largely on captain Ian Bell and Jonathan Trott, but neither lasted. Bell made 68 out of the Bears' 167 as they lost by an an innings and 94 runs. Keith Barker, dropped at slip by Jimmy Adams, weighed in down the order with an unbeaten 27, after Trott had edged spinner Mason Crane to slip for 23, but it was Kyle Abbott who did most of the damage. Under dark grey clouds, he grabbed three of Hampshire's five morning wickets, starting with Bell, then also removing Sam Hain and Tim Ambrose to finish with 4-32. The forecast rain did eventually arrive after lunch but, after a brief break, Sean Ervine took two quick wickets to finish the job. Hampshire now lead Division One by 14 points from Essex, but have played at least a game more than every other side, while Warwickshire are now bottom of the table, thanks to Somerset's draw against Middlesex at Lord's. Warwickshire were without an overseas player in this game, following long-serving spinner Jeetan Patel's call-up for Champions Trophy duty with New Zealand. Hampshire, by contrast, had three South Africans, Kyle Abbott, Rilee Rossouw and Gareth Berg, who is now England qualified on residential grounds, along with Zimbabwe-born Sean Ervine. They also have two Australians, captain George Bailey, their overseas player, and debutant Ian Holland, who also has a British passport. However, both James Vince and Liam Dawson were absent with England Lions, and Fidel Edwards is injured. 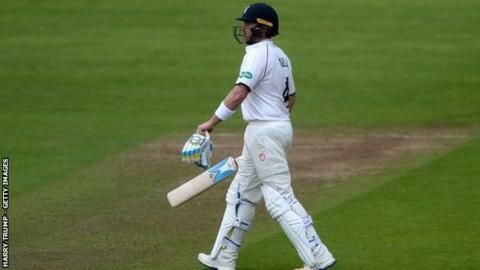 Warwickshire now have a two-week break as they do not play again in the Championship until 19 June, when they go to Chelmsford to face Essex. They could have Patel back by then as the Champions Trophy final takes place at The Oval the previous day. Hampshire next face a tour game against South Africa A, starting this Thursday, before they too return to Championship action on 19 June against Lancashire at Old Trafford. "It was a fantastic win. A great team performance. It is a great start to the season. I think the club will be really happy with that. "The only thing we spoke about this morning was about getting through Trott and Bell, then see what happens after that. If it had rained, there is not a lot we could have done. "I was proud of the way we controlled the game in the first three days. Full credit to Jimmy Adams and Sean Ervine for their phenomenal partnership. It was really hard work and they went about it their way." "We gave ourselves a lot to do. We allowed Hampshire to get away too easily. We should have got 350 in the first innings and restricted them to 400. "It is not the first time this year that has happened. We know this team needs to learn quick. Division One is ruthless. We are fighting at the minute and it looks very difficult for us. "I asked the guys to keep fighting and at times we fought really hard. I hope I can continue to take 11 guys out who want to fight for Warwickshire and want to take this club forward."